is the spot for updated information about everything related to being outside. At times gauging the content comprehension and long term interests of a group can be like a ship navigating at night. There has to be some aspect of feedback, a point of reference, as without some understanding of how the group perceives success it is impossible to navigate or move forward. There are always small moments, a flash of light to break the darkness, so that the leader can reflect and use the real-time feedback to direct or change course. Often within groups of students, body language, noise levels, group interactions and perceived levels of accomplishment can be used as clues. These are all informal, quick judgments that don’t provide enough information to confidently change the practice or application of leadership decesions. For confident decisions it is best to have a meta-cognitive reflection session and critique needs to occur. The aura of leadership can create a sense of a participant’s vulnerability when questioning a leader’s choices. So, a group’s ability to provide free flowing feedback is hard to cultivate. How does a leader know if the group is just following or are actually being lead? All of this hinges on the abilities of a leader to create opportunities, promote a groups willingness to speak openly and foster a group dynamic, which would allow a leader to ask and receive worthwhile feedback or critique. Often the role of a leader promotes the very emotional trap that prohibits feedback: a feeling of not being able to critique without negative repercussions. Countless times have I asked for feedback to just receive lumpy, lukewarm, half-truths that are meant to placate the most of bland leadership palettes while protecting the participant from perceived harm. Or worst of all, I have been answered with silence. It is always a struggle not to admonish the group, to goad them to truth or force them to present their real feelings, this has never worked. I essentially closed the door on my group’s willingness to risk the social or group pressures to speak openly. This cycle is even more precarious and hard to cultivate within a similar aged peer group. The dynamics and inherent hierarchy are almost impossible to over come for all members. Leadership feedback, hinges on the openness of the question of ‘what can I do better…next time?’ without the sense of emotional payback. Members of the group have to feel that their perspective is valuable. The structure for effective group feedback is easy to write out, yet difficult and time consuming to cultivate and is easily upset. 1. Self-awareness of the leader ~ Being sensitive and aware of the group perceptions, abilities and feeling of safety. Cultivating and supporting an authentic interest in hearing the concerns and praise of the group. 2. Setting up a discussion structure which will allow for self-reflection, social safety and active listening. How do you feel it went? These questions have to be continually asked and given time to take hold in the group’s working language. As the critique comes in, speak openly about what changes or effects the feedback has on the group, your leadership and the future direction. The members of the group will begin to see that their voices have power, their perspective is valuable to others and that they are important part of the well being of the groups productivity. A large part of how I build feedback trust is the anonymous feedback survey. 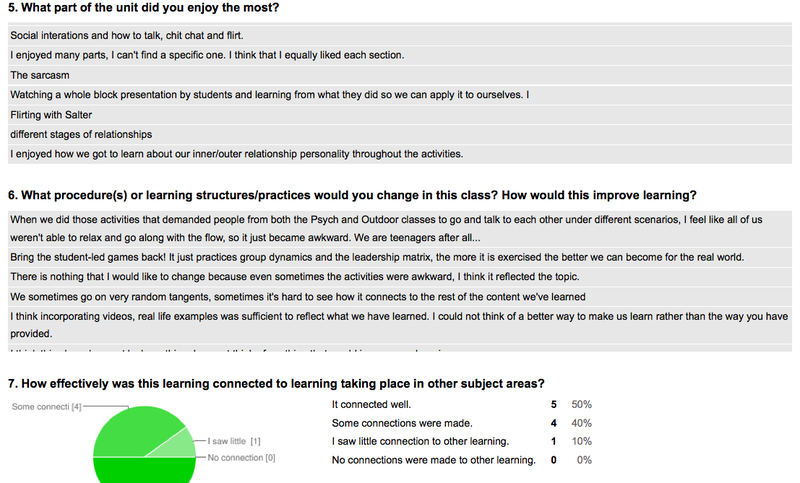 I share the results with the group and discuss how, what, when and why the feedback changes or affects my leadership. Yet, this type of feedback must be shared and then commented upon. If no perceptible changes or dialogue occurs the members of the group feel disenfranchised. Short answers coupled with a rating system are great for high school students. Quick, easy and anonymous.